At the Tufenkian showroom guests can watch a carpet being woven. "My friend. For you, a special deal." Ignore those words. There are no special deals and here's why: The seller is smarter than you. You will not get a deal that he does not want you to have. Live with that reality. And if you think you are going to stroll through the market and stroll out with a carpet worth five times what you paid, remember this: Sometimes - most of the time - cheap is just cheap. Admit that you are out of your league trying to outwit the pros and shop for something you like, rather than for a bargain. Edgar Janjutyan, sales manager of Tufenkian Carpets (www.tufenkian.am), knows a lot about carpets. They are his livelihood. His first piece of advice to a tourist turned rug buyer - especially if vernissage is where you'll be shopping - is to find a trusted friend here and take him or her with you when you go looking. "The risk of buying rugs from vernissage is totally your decision," Janjutyan says. "First of all, the seller will lie about the price, then he will lie about the quality, then he will lie about the date it was made." It's part of the system. If you enjoy haggling, you'll have a great time. Take your time, Janjutyan advises. "The deal should take at least a half hour," he says. "Remember that every minute you are making the price different. Bargain till the very end." The seller will try to trick you. Try to trick him back. It's part of the dance. Do not, Janjutyan advises, let on that you are excited about the rug. Think of the rug as a used car. 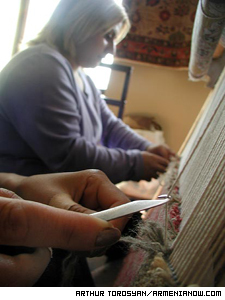 At the Tufenkian showroom, on Tumanyan Street near the Opera, you can watch craftswomen create a carpet and get a sense of what to look for. The rugs there are on the high end of the market and are mostly for an upscale clientele. But whether in a Western-style show room or in a basement shop, judging the quality of a rug is a matter of counting knots. 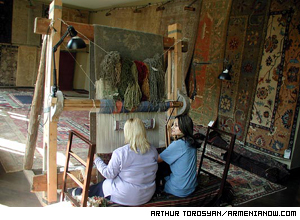 The lowest-quality Armenian carpet will be 25 by 25, meaning it has 25 knots per square decimeter. To estimate quality, count the knots. The top of the line should be 40 by 40. How do you know? Simple: Turn back an edge of the carpet and count the knots - they'll look like pixels on a computer screen. This little move, Janjutyan says, will give the buyer some edge in the bargaining. "The seller will get the idea that you know something about carpets and will see that you are not an amateur." Many carpets you'll see here have been brought from storage, in places that are not always conducive to preservation. Insects, Janjutyan says, can be a bad factor for rug buyers. His advice: Turn the carpet over and hold it between your face and the sun. Any holes or damages will be penetrated by the sunlight. "Having it repaired abroad will cost more than you paid for the rug." Think you're going to find a national treasure at a flea-market price? Forget that notion. Until about the mid-90s, Janjutyan says, it was possible to find antique carpets of great value being sold by common homeowners who simply needed money. Not any more. There are, in fact, professionals who travel throughout the regions, going into homes looking for carpets of antiquity. But those rare finds don't stay in Armenia long enough for any tourist to find them. Instead they are shipped off to places such as Austria, where a carpet purchased for $1,000 from some very-willing villager will fetch $15,000 in a Viennese showroom. Finally, be aware that any carpet taken out of Armenia must have tax and customs certification. The total fee is approximately 200 to 1,000 drams per square meter. You will also need to pay for two photographs of the carpet to be kept in those government offices. Any dealer should be able to take care of the paper work for you, but make sure you ask. Know, too, that commissions are only made on Monday and Wednesdays. So, if you're time in Armenia is short, make sure you make your rug purchase in time to have it commissioned. Otherwise you'll have more hassle at the airport than you ever got from that carpet seller.